Shopping centres are my mortal enemy at the best of times. At Christmas, the enmity ratchets up several hundred notches to the point where I’d rather eat puréed eggplant with a side of smoked cod than enter the damnèd portal of the Temple of Pointless Spending. You can therefore imagine my delight when I realised I could make Christmas presents and thereby avoid shopping centres entirely. If you are not one of these crazy people would rather spend hours toiling over handmade presents than facing the Christmas shopping crowds, then you may not know there’s a set of unspoken rules for the whole business. Firstly, you should know that if you have ever received a handmade present, then the person who made it thinks pretty highly of you. No-one is going to spend hours making a present for a passing acquaintance or someone who keeps stealing their pens at work. In short: congratulations! You’ve made it to a crafter’s short-list. Secondly, you must be aware that the things you wear or the colour preferences you reveal will be noted down and saved for future reference. So if you happen to have a suspicion that someone might be making you a gift, think nothing of casually mentioning how much you love teal, or that you don’t have enough orange things in your house. This will be regarded as incredibly useful intelligence by the crafter. Thirdly, the mere act of giving away a hand-crafted present has been a huge wrench for the crafter. Nine times out of ten, the crafter will sit there, stroking the finished object and feeling pangs of heartache at the knowledge that it will be given away. And this is the one dilemma we face with handmade presents. We do love giving them away but it is ridiculously difficult at times. Personally, I hope this means I’ve made something that will be treasured by the recipient, but I can never stop feeling a little jealous that they’ll be the ones enjoying it instead of me. Why, why isn’t it in my kitchen right now, ready to keep some tea toasty warm? Ah, I miss it so much already and it’s only been a few hours since I gave it away. If only you could see how well it fits on both of my teapots! Well, actually, you can see how well it fits on at least one of them. And look: lovely ripply rows of crochet! Yes, I enjoyed making it and yes, I was ninety-five percent sure the giftee would like it but yes, it was nevertheless a sombre moment as I wrapped up the tea cosy, preparing it for its journey to its new home. Obviously, I still have the pattern, so I could easily make one for myself if I really wanted to. And now that the Summer holidays have finally started, I’ll have plenty of spare time in which to do so. Although it may have to go in line behind the cardigan I’m still knitting, not to mention numerous pairs of socks that currently exist only as balls of wool. And a super secret project with a deadline. Oh, and the three dresses I have planned to sew. Actually, I’m probably going to be quite exhausted by the time the holidays are over. I’ll barely have any time free to miss the tea cosy after all. Tools: 4mm knitting needles; 4mm crochet hook; wool needle. I completely ABSOLUTELY agree with this post. I make a lot of my presents because I ahte the shops so much. Like, literally honestly, hate I shopping. I made a few of my gifts this year and I do origami so there’s lots of pinterest inspiration that helps out there. 😉 Your tea cosy is amazing! You are a very talented knitter! Pinterest is a fantastic enabler. I once saw a crocheted owl tea cosy on Pinterest, which started a quest for the pattern that ended only after an eBay purchase from New Zealand. But it was worth it! Yes! This is painfully true. More people need to read this and understand what crafters go through when gifting to friends and family. It simply isn’t easy, is it? I’m glad to know I’m not alone in feeling this way. Incidentally, your avatar reminded me of a TARDIS Christmas tree ornament I made and gave away a couple of years ago. Now that was a wrench! 4. It makes a nice heavy substantial-feeling gift. Making actual things for people – I do that (BIIIIIIIIIIG crocheted blanket for a wedding this past year and baby blankets galore) but it’s tough (I have a blanket that I have mentally given to about three different people, but no actual people …). 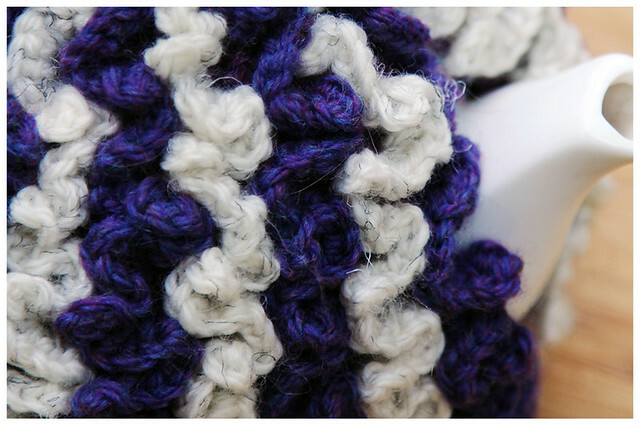 I am haunted by my aunt’s bitterness when she gave a beautiful plaid crochet blanket to a daughter in law (seriously, she made a woven tartan rug from crochet chains – it was incredible), only to find it in the boot box … UNDER the shoes. I’m no fan of Christmas cake, either, but it is definitly an impressive creation. My mum makes an amazing cake every Christmas and I always admire it but I never eat it. Yet everyone else seems to adore it, so I think you’ve hit on the perfect plan. Your aunt’s story is somewhat traumatic. I can only imagine the hours of work that would have gone into that blanket – hours that were made bearable by the imagined warmth and delight it would provide for its recipient – only to have it stored away as though it was worthless. This is why we try to choose our crafty recipients with such care, but you never can tell. You should definitely make one yourself! 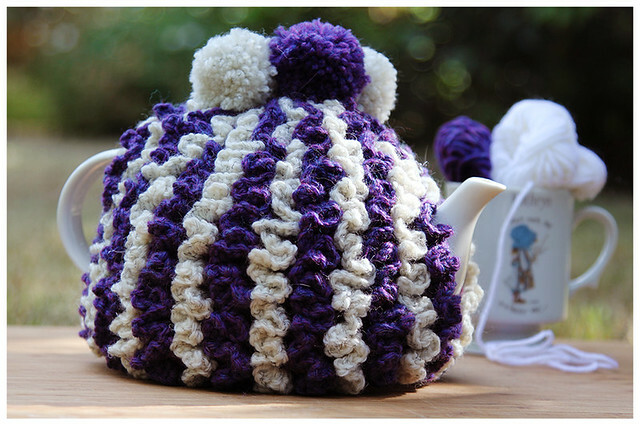 The ripples look fantastic but they also make it incredibly thick – your teapot will be staying toasty warm for ages when it’s wearing that cosy. Would you believe I almost didn’t add the pom poms? I’m so glad I did, though. Sure! 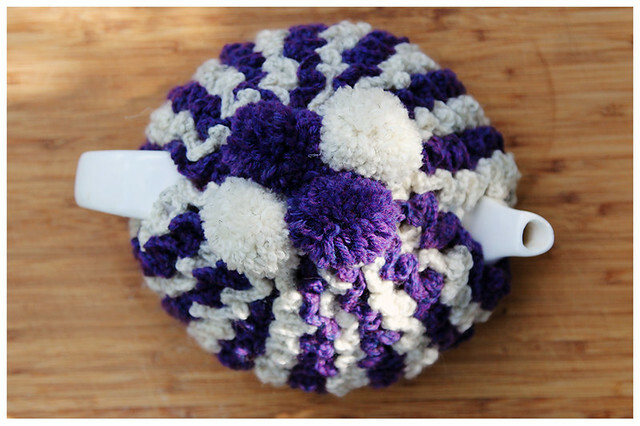 It’s called the “Staffordshire Tea Cosy” and it’s in Paton’s Big Book of Small Projects 2. 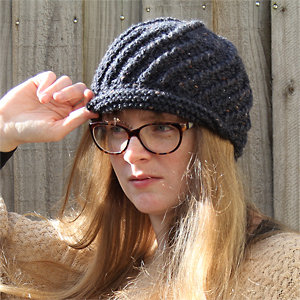 I’m not sure if it’s available online anywhere, but you might be able to find something similar on Ravelry if you can’t get hold of the book. Wow, that is an impressive tea cosy. And a very selfless act to give it to someone. Personally, I’m kind of too lazy to make Christmas presents, I don’t really like an enforced gift-giving period especially when we all basically have everything we need (sorry, sounding very Grinchy!). But then I will spend heaps of time making birthday presents, so I *can* be nice and generous when I want to be!! You don’t sound Grinchy to me – you should hear me go whenever I find myself forced to spend time in a shopping centre around Christmas. It’s weird, but making presents has made me feel a whole lot better about the enforced gift-giving business. There’s just something enjoyable about making something useful or precious for someone that you just don’t get with a bought gift. I also think it makes much more sense to make birthday gifts instead of Christmas presents – it spreads them out a little better! Unless your friends have inconsiderately arranged to have their birthdays in the same month, of course. I’m glad it’s not just me with the giving agony. It’s so enjoyable but, er, I want it all too. Without having to make it twice, thanks. Yes, that’s exactly it! Some sort of instantaneous cloning process at the completion of the project would be perfect.